You will be given a Free reference e-book to read which has 619 pages And the test will be based on that e-book. The CCNP remote access test is a relevant requirement towards acquiring a CCNP certification. It allows you to become a Cisco Certified Network Professional (CCNP) by measuring your skills in building the most efficient and powerful Cisco remote access networks and implementing and designing remote access networks with the help of ISDN BRI, Dial-up, frame relay, authentication schemes and x.25 network configurations. The test also aims to evaluate and assess your skills and ability when it comes to building not only remote access networks but interconnect central sites as well into telecommuters or home office and branch offices. It also requires you to fully understand how to control central site access and maximize the utilization of bandwidth over the links of the remote. It should also be noted that you have greater chances of passing the test if you acquire a more extensive knowledge about physical connectivity deployment of WAN devices crucial for remote access purposes, modem connections implementation, configuration and control and utilization of PPP or Point-to-Point versatility which is one of the most vital factors for remote access networks. But regardless of the numerous topics covered in the CCNP remote access test, you have a hundred percent guarantee that everything will be covered and mastered upon deciding to take part in the free CCNP remote access certification practice course provided by Brainmeasures. You will definitely enjoy taking up this course especially if you consider how extensive the coverage of its free study guide and practice test is. The comprehensiveness of the free CCNP remote access certification practice course offered by Brainmeasures is one of its most remarkable qualities and this can lead you towards gaining a more complete understanding about the field. One thing that you will immediately find impressive in this free practice course is its well-developed free study guide filled with the most accurate and updated information regarding the field. This free study guide highlights the most essential aspects and topics relevant to the field that are extremely useful in your attempt to easily answer all the CCNP remote access test questions. You will also find the practice course’s free practice test impressive considering its effectiveness in increasing the level of your awareness about what are included and excluded in the actual certification test so you will have greater chances of passing it. 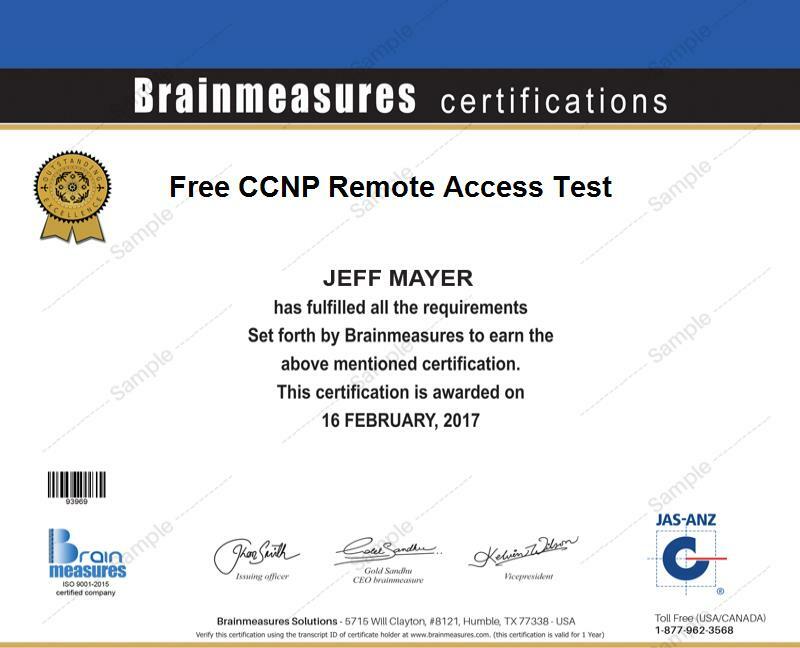 The free CCNP remote access certification practice course now offered by Brainmeasures aims to benefit lots of individuals and professionals. You can expect this free practice course to be really beneficial for all aspiring Cisco Certified Network Professionals (CCNP) as well as network designers, network managers, network engineers, systems engineers, network administrators, network technicians and sales support engineers. Being able to show that you are skilled in the field by passing the CCNP remote access certification test also works in raising the level of salary that you regularly receive. You will definitely enjoy using your certificate to work as a network designer because it leads you to receive approximately $45,000 to $101,000 every year. Utilizing your certificate to become a network manager also allows you to reward yourself with an annual salary range of $57,000 to $123,000.